Home/Blog, Digital Pen Technology/Magic pens! When people name this era in the future it will surely be the age of digital communication or techno-gadget time. Mobile phones that get smarter and smarter, ipad and other smaller tablets and humanoid robots only scratch the surface of new technology which changes as fast as we can read this! This is also highlighted by the Internet as it’s even easy to keep track of what DataSpace are doing in the social media. At DataSpace UK we are supplying one of the easiest and most cost-effective methods of transferring information, The Digital Pen. 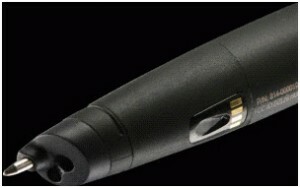 Digital Pen Technology allows you to write normally but transfer your information directly to your computer. It is particularly useful for people who need to collect information ‘in the field’ as forms or other documents made from special paper with a ‘dot pattern’, can be completed with the pen and at the selection of a check-box, all of the information is transferred to your head office/computer. This speeds up processing of orders and other processes as the written word goes digital immediately. The resulting digital view looks like a clearly scanned document and does away with the necessity to keep the original hand-written document. This information can be shared with as many departments as necessary, instantly. DataSpace’s Digital Pen looks like an ordinary pen but contains a camera which reads the microscopic dot pattern on the special paper as it writes. Once the user checks the box, the data automatically transfers to head office using your mobile phone. At the office, you can release the information stored on the pen via a USB cradle attached to your computer. It’s fast and convenient and it saves valuable time processing forms and then storing them â€“ the pen does it all for you. Can you see a way your company can make use of this technology? If so please contact DataSpace UK for more information on 0800 028 8956.